In common with our other non FIA races, this weekend we are primarily in “testing mode” although to get a good result at the same time would of course be possible. As is common practice for us now the first qualifying run is a soft setup in order not to lose traction on the start line, which was very successful with a reasonable 5.67et and 263mph speed fast enough for the first half of a new British speed record, Unfortunately after the run we found No1 piston had melted and after investigation David found a blocked jet for that cylinder. On the second qualifier after replacing the damaged piston we stepped up the settings on the car which produced a better elapsed time of 5.42 good enough for a new British record and No 1 qualifier position, but the slower speed of 258mph indicated that there may be a problem, after our normal maintenance when we started up there was a haze of oil smoke from No 1 cyl and as we had just replaced the piston I could not risk running the engine in the third qualifying session despite the great temptation in order to try other settings.On inspection it was the right decision as a problem was found which I missed when we replaced the piston after the first run, but after a few hours work by the crew Ricki, Harry and David a new piston and liner were installed and the engine ran perfectly, ready for our last qualifying run the next day. Sunday dawned brighter and the day got increasing warmer than yesterday and as this can affect the track we checked it out. The track crew had done their usual terrific job of prepping the track, thanks guys. 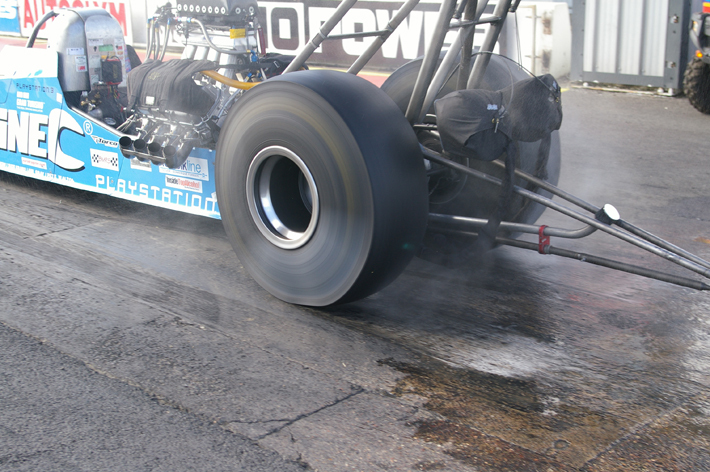 Well we ran the car with the more aggressive set up that we wanted to try the previous day, but it was too much and we went “up in smoke” after about 3 feet, so when we got back to the pit after our normal maintenance we changed the set up to match our second qualifier. First round, and as we are No.1 qualifier we have the benefit of a bye run and repeat our previous ET with the same set up, but this time without the blocked jet and resultant burned piston, the car pulls hard in the second half of the track and records a 271 mph speed, way over our new record despite having to pedal the throttle momentarily due to shake at mid track. Everything on the car checks out ok and we are in the final, but our opponent is out with a broken con rod which allows us the luxury of more changes to the set up without pressure. 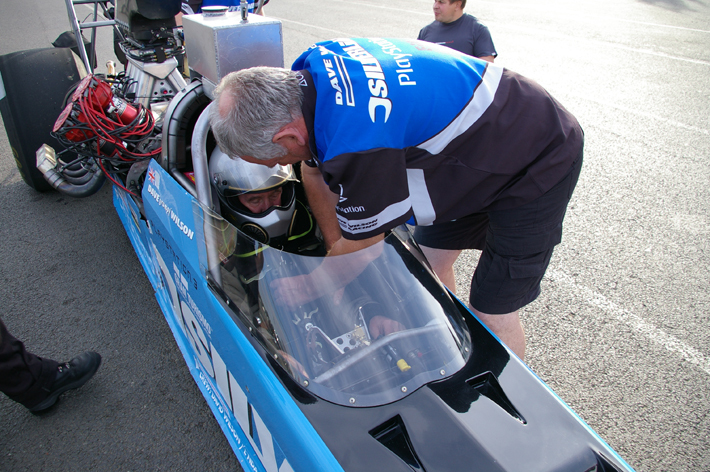 This run in the final does not improve our performance although it is still a good solid 5.53 251 run not fast enough to back up our 271 mph run so we have to settle for a race win and two new records at our final race for 2009. Now we can look forward to 2010 with a very competitive car once again and take on the best in a bid for our elusive 6th championship title.